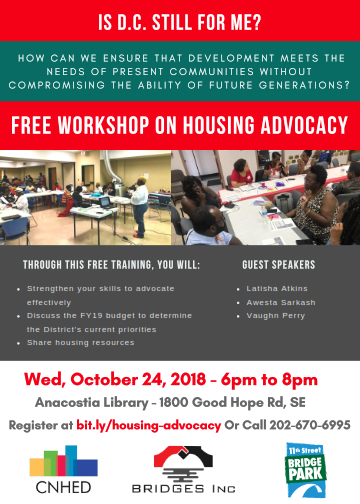 APACC member 11th Street Bridge Park and friends CNHED and BRIDGES are inviting those interested in ensuring longtime residents can benefit from development and not be pushed out to a free workshop on housing advocacy. The event takes place Wednesday, October 24, 6:00-8:00 pm at Anacostia Library (1800 Good Hope Rd SE). Register: bit.ly/housing-advocacy or (202) 670-6995. Equitable redevelopment of the Anacostia River Corridor, particularly ensuring that changes benefit and improve the lives and livelihoods of both current and future residents, is a central principle in APACC’s work. Changes—aka improvements—impact housing in a major way, too often pricing current residents out of the housing market. Like the workshop sponsors, APACC believes policies and practices must make a concerted effort to protect those who have lived close to the Anacostia River and Anacostia Park throughout the development process.